Powers/Abilities: None. He wore fake fangs and talons and used a gun. He had some knowledge about the Darkhold and probably other magical stuff as well. He wasn't seen using any magic, but he still had some loyal followers who worked along with him. (Marvel Comics Presents#64/4 (fb) - BTS) - Reaver became the leader of a new Darkholders sect. They spread the rumor that they were in possession of the Darkhold. Vampire hunters Frank Drake and Hannibal King heard the rumor and became afraid that the Darkholders would bring back vampires. Meanwhile Reaver forged an evil plan to trick Blade into killing his beloved Safron as a revenge on Blade for killing Dracula. (Marvel Comics Presents#64/4) - While Blade spoke in Hubris' show, Reaver kidnapped Safron from the green room. His allies demolished the room and wrote "Darkholders live" on the wall. Reaver brought Safron to the Darkholders' castle, drugged her, put fake fangs into her mouth and started Reaver with his false ritual. Blade arrived at the castle and heard Reaver talking about making Safron a vampire by giving her some special blood to drink. Blade attacked the Darkholders while Reaver told him that Safron was now one of them. Reaver drew a gun and Blade hit Reaver with a wooden stick through his hand. Blade then revealed that he knew that this was a scam. 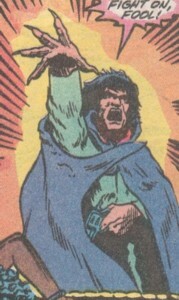 The Darkholders tried to flee, but Blade took Reaver's gun from the ground and they surrendered. Comments: Created by Marcus McLaurin, Malcolm Davis & Joseph Adiletta. No magic in the story, but he was a Darkholder and magic was one of their things. The Legion of the Damned had used the exact same trick on Blade, attempting to trick him into thinking Safron was a vampire and destroying her. Though he failed to fall for the Reaver's duplicity, Blade apparently fell for this trick once again in the 2002 MAX Blade series, and he accidentally killed his then-girlfriend Yathalea this time. Some guys just don't learn. 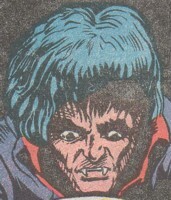 His real name was revealed in the Vampires profile in OHOTMU A-Z HC#12. He was the host of a daily talk show and also a member of a new sect of Darkholders. One night Blade was guest on his show and Hubris tried to ridicule Blade and his work while Safron was kidnapped behind the scenes. After the show Hubris called Reaver and told him that everything went well and that Blade couldn't stop there plans that night. Blade caught Hubris with the phone and learned from him the Darkholders' destination. Blade left Hubris behind for the cops.